When the franchise launched back in 2001, I admit I lacked much interest in Harry Potter. I saw the first few films because I had to do so - there was no way I could run this site and ignore such a massively successful property - but I wasn’t particularly enthusiastic about the films. At least not until 2005 and the fourth entry, Harry Potter and the Goblet of Fire. That one gave the series a darker edge and made me more interested, a trend that continued with flick five, Harry Potter and the Order of the Phoenix. Movie six - Harry Potter and the Half-Blood Prince - was a mild disappointment, but I remained excited to see where the franchise would finish. I got half the answer in November 2010 with Harry Potter and the Deathly Hallows - Part 1, and the series wrapped in July 2011 via Hallows - Part 2. Matters concluded in a satisfying manner, as Part 2 finishes off the franchise in fine fashion. Warning: you’re entering a spoiler zone! If you want to avoid Part 2 plot points, skip to the technical parts of the review. Part 2 begins immediately after the finish of Part 1. Harry Potter (Daniel Radcliffe) and his pals Hermione Granger (Emma Watson) and Ron Weasley (Rupert Grint) seek items called Horcruxes that represent evil Lord Voldemort’s (Ralph Fiennes) mortality and their destruction may offer the key to his defeat. They go through a mix of escapades along the way, and we see a major assault on Hogwarts, the school of magic where Harry first met his friends. All this inevitably leads toward a final showdown between Harry and Voldemort. As I consider Part 2, I find myself more involved in reflections about the series as a whole than on this specific movie. I find it remarkable that the franchise progressed and grew so well. What started as a pretty fluffy couple of kiddie movies evolved and developed into something borderline epic along the way. Part 2 concludes matters in a manner that lives up to that stature. Some have complained about the lack of humor in the film, but I’m fine with its dark tone. (The movie does include some comic relief, by the way – it’s not unrelenting darkness.) Part 2 should take us to the brink of apocalypse in a literal sense, as a Voldemort victory would lay waste to humanity. That’s not a story suited to wisecracks and silliness, is it? I don’t think so, which is why I appreciate the flick’s general cheerlessness – and its emotional impact as well. I can’t tell you when I developed an attachment to Harry and his pals - heck, I didn’t realize that I had grown to care about them until the last couple of movies. But I had, and that emotional impact becomes a crucial aspect of Part 2. To some degree, the majority of the movie acts as a tease because we’re just waiting to get to that inevitable final showdown and find out if Harry will defeat his nemesis. It should come as no shock that the answer is “yes”, but the movie doesn’t make it a predictable ride with a clear-cut ending. I avoided all spoilers until I saw Part 2, but a friend’s (jerky) boyfriend nearly tripped up my efforts. In fall 2010, my then-girlfriend and I went out to dinner with my friend and his boyfriend the same night she and I saw Part 1. My girlfriend mentioned this to Jerky Boyfriend and indicated that the finale wouldn’t be out until the next summer. “That’s the one where Harry dies, right?” blurted Jerky Boyfriend – and I nearly leapt across the table to throttle him. As it turns out, Jerky Boyfriend was right and wrong – though mostly wrong. Harry does survive Part 2 - and we even get to see an epilogue that shows Potter and the others 19 years down the road. A bad epilogue, unfortunately, and the only really weak part of Part 2. We find out who married who and what children resulted as we see the offspring of Potter and the others go to Hogwarts. Why do I so intensely dislike the epilogue? For one, I think it’s unnecessary and kind of spells the death of imagination. The final “present day” scene gives us a nice conclusion as it shows Harry, Ron and Hermione after Voldemort’s defeat and an evaluation of the ramifications. It provides an emotional capper to the series that should’ve stood on its own. But then the stinkin’ screen has to show “19 Years Later” and ruin it all. I suspect that author JK Rowling penned the epilogue to back herself into a corner. She wanted the Potter series to end and not feel tempted to return to the well in the future. If the epilogue exists solely to prevent Rowling from succumbing to temptation, I don’t think that’s a good reason. I won’t say it ruins the movie’s finale, but it ensures that the audience can’t use their imaginations and conjure their own ideas of what happens to Harry and the others post-Voldemort. That’s a shame; I really would’ve preferred the more emotional and open-ended finish that you’d get if you conclude the film before the epilogue. Happily, Part 2 does pretty much everything right as it approaches the Awful Epilogue. Continuing in “Looking Back” mode, I find it somewhat astonishing to see how much Radcliffe grew as an actor across the eight films. Radcliffe began as a weak link who lacked much personality through the first few movies. He started to come to life around Goblet and continued that progression through the remaining films. Indeed, Radcliffe eventually developed into one of the series’ strengths, as he gave Harry surprising heart and dimension toward the end. He grew into the solid actor we see here, and that helps both the believability of Harry as the “chosen one” as well as the movie’s emotional impact. We do find plenty of the latter in Part 2, as it packs plenty of punch. Some of this comes from the expected showdown between Harry and Voldemort, but some surprising emotion arises from unanticipated sources. Villains find redemption and weaklings show bravery and power; those elements add to the movie’s already considerable punch. At no point will I ever consider the Harry Potter series to be a great one, but after eight films and 10 years, I must admit it developed into a consistent, dynamic and engaging franchise. Harry Potter and the Deathly Hallows - Part 2 ran the risk that it’d end things on a weak note, but it manages to live up to almost all expectations. 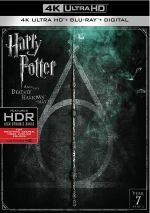 Harry Potter and the Deathly Hallows - Part 2 appears in an aspect ratio of approximately 2.40:1 on this 4K UHD Disc. The movie offered a fine presentation. At all times, sharpness looked great, as the movie exhibited fine definition and lacked any signs of softness. I witnessed no jaggies or moiré effects, and edge haloes failed to appear. As usual, the transfer didn’t display print flaws. None of the prior Potter films went with lively palettes, and that continued in this nearly monochromatic experience. Colors were always subdued, but within the stylistic constraints, they looked fine. Blacks were also dark and tight, and shadows usually offered nice delineation. A few seemed a bit muddy but those were in the minority. Overall, this turned into a solid image. No concerns greeted the movie’s DTS-X soundtrack. Downconverted to DTS-HD MA 7.1, this was probably the liveliest of the eight flicks, and the soundscape came to life in dynamic fashion. The scenes underground at Gringott’s launched the action in fine fashion, with the fun “mine cart” ride and the intense destruction and rage of the dragon. All of those elements zipped around the room and engulfed us in the material. Matters continued to impress from there. Because Part 2 came with a mix of quiet and loud scenes, it didn’t dazzle on a continual basis, but it still seemed convincing at all times, and the more active sequences were stunners. The attack on Hogwart’s and its destruction came as additional standouts, though plenty of other excellent sequences came along for the ride as well. This was a really stellar soundfield. Audio quality always excelled as well. Effects were accurate and bold, with clear highs and deep lows. Music showed nice range and punch, while speech seemed concise and distinctive. I called the Part 1 the best Potter soundtrack to date, but Part 2 beat it, as this was an amazing track that fell just short of “A+” standards. How did this 4K UHD compare to the original Blu-ray from 2011? Audio delivered a bit more breadth and range, while visuals showed superior delineation as well as more dynamic colors and clearer shadows. The 4K delivered the superior rendition of the film. The 4K disc lacks extras, but two bonus Blu-rays pack many materials. On Blu-ray One, we open with Maximum Movie Mode. Actor Matthew Lewis introduces the piece, and we also hear from producers David Barron and David Heyman, director David Yates, makeup effects supervisor Nick Dudman, 2nd unit director Stephen Woolfenden, visual effects supervisor Tim Burke, and actors Warwick Davis, Daniel Radcliffe, Rupert Grint, James and Oliver Phelps, Emma Watson, Jason Isaacs, Bonnie Wright, Jessie Cave, Tom Felton, and Mark Williams. The “Mode” looks at the film’s opening and tone, cast, characters and performances, makeup and various effects, story issues, deleted scenes and editing, connections to prior films and comparisons to the book, stunts and action, sets, and the finish of the series. If you saw the “Mode” for Hallows Part 1, you’ll know what to expect here, and most of the content consists of “ Walk-ins”. These shrink the movie image to feature the film participant as he or she explains various components. Through these moments, we see footage from the set and other components, but they remain the main focus. The Part 1 “Mode” had some good moments but ultimately frustrated due to sparse content and a lack of user-friendliness. 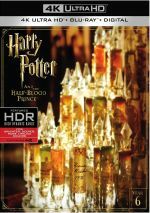 The “Mode” for Half-Blood Prince let viewers skip from one bit to another, but the “Modes” for the two Hallows flick don’t include that convenience. This becomes less problematic for the Part 2 “Mode”, simply because it lacks as much dead air. Oh, we still get a few more empty spaces than I’d like, but they don’t become as tiresome as they did for the prior film. The quality of the content can be a bit dodgy, though. While we learn a fair amount about the movie, we get a few too many superficial moments, such as the reels that feel like “greatest hits” from earlier movies. Still, we do learn a reasonable amount about the film, and the “Mode” becomes a fairly satisfying program. We can check out the eight Focus Points on their own or as branches of “Maximum Movie Mode”. These include “Aberforth Dumbledore”(2:37), “Deathly Hallows Costume Changes” (3:13), “Harry Returns to Hogwarts” (3:21), “The Hogwarts Shield” (2:27), “The Room of Requirement Set” (3:13), “The Fiery Escape” (3:49), “Neville’s Stand” (4:15) and “Molly Takes Down Bellatrix” (3:27). In total, they run 26 minutes, 27 seconds, and across them, we hear from Yates, Radcliffe, Isaacs, Lewis, Watson, Heyman, Grint, Burke, Felton, Woolfenden, James and Oliver Phelps, costume designer Jany Temime, production designer Stuart Craig, art director Alastair Bullock, set decorator Stephenie McMillan, production buyer Lucinda Sturgis, stuntman Martin Wilde, special effects supervisor John Richardson, stunt coordinator Greg Powell, and actors Ciaran Hinds, Julie Walters, Helena Bonham Carter, Robbie Coltrane and Evanna Lynch. The programs look at cast and performances, characters and story, various effects and costumes, sets and props, stunts and action. None of the “Points” deliver a great deal of depth, but they help expand subjects seen during the “Mode”. These tell us more info about the different production areas and add a layer of richness to the experience. Final Farewells from Cast and Crew runs three minutes, seven seconds and provides statements from Oliver and James Phelps, Mark Williams, Warwick Davis, Tom Felton, Bonnie Wright, Jessie Cave, Rupert Grint, Daniel Radcliffe, David Barron, Stephen Woolfenden, Nick Dudman, Tim Burke, David Yates, Matthew Lewis, Jason Isaacs, and Emma Watson. All tell us what a wonderful experience the Potter series was and how much they’ll miss it. The piece is painless but not particularly rewarding. 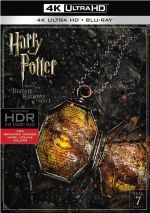 Blu-ray One opens with ads for the 2012 Harry Potter “Definitive Edition”, the “Pottermore” website, and the Lego Harry Potter videogame. 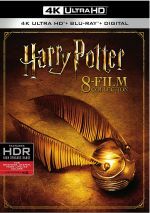 Over on Blu-ray Two, Creating the World of Harry Potter Part 8: Growing Up goes for 49 minutes, 19 seconds and features Radcliffe, Heyman, Watson, Grint, Felton, Barron, Williams, Rowling, Isaacs, James and Oliver Phelps, directors Chris Columbus, Alfonso Cuaron, Mike Newell and David Yates, head of education Janet Mills, and actors Richard Harris, Robbie Coltrane, Alfie Enoch, Alan Rickman, Matthew Lewis, Maggie Smith, Kenneth Branagh, Jessie Cave, and Katie Leung. As implied by the title, “Growing Up” traces the evolution of the series’ young actors, with an emphasis on the three leads. The show can be a bit soppy at times, but it’s usually a warm, enjoyable look back at the ways the actors changed over the years. It’s nice to see the contrast via interviews from over 10 years, and we get a nice feel for the topic. This becomes a nostalgic, enjoyable piece. Another continuation of a series, Harry Potter and the Deathly Hallows – Part 2: Behind the Magic occupies 47 minutes, one second. Again hosted by Ben Shephard, this one provides info from Radcliffe, Grint, Watson, Heyman, Carter, Yates, Dudman, Warwick Davis, Burke, Felton, Craig, Barron, Bohanna, Wright, Williams, Lewis, Walters, prop man Sidney Wilson and makeup designer Amanda Knight. Expect this one to offer topics – and tone – similar to what we saw in the prior entry. We get a frothy mix of movie elements and see Shephard put into makeup to receive “battle wounds”. Like its predecessors, this show offers a fun and interesting overview of the production. Next comes A Conversation with JK Rowling and Daniel Radcliffe. A longer version of a program on the original Part 2 release, this runs one hour, three minutes, 20 seconds as the author and the actor discuss his casting and her involvement in the process, other cast/character/story notions, changes from her books and aspects of the evolution of the novels, and living with the success of the Potter world. Though both have a lot to say, Rowling dominates and gives us the most interesting parts of “Conversation”. She lets us take a nice glimpse behind the scenes to learn more about her writing processes and working through Potter areas. It’s fun to see arguably the two most important figures in the franchise chat for such a long period, and this ends up as an enjoyable piece. Hogwarts’ Last Stand fills 30 minutes, 27 seconds with notes from Yates, Barron, Heyman, Rowling, Watson, Powell, Woolfenden, Richardson, Lewis, Dudman, Felton, Fiennes, Coltrane, Craig, Isaacs, Radcliffe, James and Oliver Phelps, Grint, McMillan, Rickman, Wright, stunt performers Martin Wilde and Marc Mailley and actor Devon Murray. This program concentrates on all the elements required to bring together the movie’s climactic final third or so. It gets into a lot of good details and provides a satisfying examination of the specifics. Note that the disc lists this as an “Extended Version” of the show. Unless I missed it somehow, it didn’t appear on the Part 2 Blu-ray, so I don’t know where the non-extended cut appeared. Two repeated featurettes follow. The Goblins of Gringotts goes for 10 minutes, 56 seconds and provides notes from Nick Dudman, Warwick Davis, and actors Rusty Goffe, Binde Johal, Lauren Barnard, Nathan Phillips, Nikki McInness, Samantha Davis, and Maxwell Laird. We learn about the goblin makeup and the actors who played them. This is a nice look at a side of the filmmaking process that usually doesn’t get much attention. In the 22-minute, 31-second The Women of Harry Potter, we hear from Rowling, Wright, Watson, Walters, Carter, and actors Helen McCrory and Imelda Staunton. As expected, the program looks at the female characters and actors in the Potter series. Some of this seems self-congratulatory, but we still get decent information. Most of this comes from Rowling, who again provides nice insights into her creations. A bunch of short-ish new not-on-the-original-Blu-ray featurettes come next. These include “The Great Hall of Hogwarts” (4:13), “Ron and Hermione’s Kiss” (4:12), “That’s a Wrap, Harry” (4:55), “Neville’s Battle Makeup” (4:11), “The Gringotts Disguises” (4:07), and “Harry’s Death: The Courtyard Confrontation” (10:14). Across these, we find info from Radcliffe, Grint, Watson, Yates, Heyman, Barron, Felton, Lewis, James and Oliver Phelps, Wright, Craig, Lynch, Dudman, Carter, Fennes, Rowling, Lynch, Murray, Enoch, Coltrane, Isaacs, McCrory, 1st AD Jamie Christopher and actor David Bradley. These look at sets, the big smooching scene, feelings about finishing the series, makeup and costumes, and the final battle between Harry and Voldemort. These resemble earlier programs – and sometimes use the same footage – so don’t expect revelations. Still, they include some good new information and remain enjoyable. 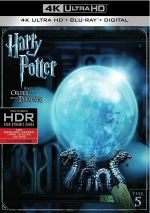 Under Harry Potter and the Deathly Hallows: The Quest, we find an additional 16 short featurettes. Because my fingers are getting tired, I’m not going to type out the titles of all of them, but I will say they run a total of 53 minutes, 37 seconds of material. These feature Ifans, Watson, Radcliffe, Shephard, Bohanna, Fiennes, Newell, Isaacs, Yates, Rowling, Rickman, Barron, Grint, Heyman, Walters, Williams, James and Oliver Phelps, Enoch, Murray, Cave, Wright, Enoch, Lynch, Columbus, Toby Jones, Warwick Davis, animation supervisor Pablo Grillo, and actor Michael Gambon. The pieces cover a mix of topics like performances, characters and actors, props and effects, the premiere, Ron’s romances and aspects of his family, favorite dialogue, props and costumes, a tour of the main studio, and saying goodbye to the series. These pieces originally ran online as promotion, and they emit the fluffiness one expects of those origins. Nonetheless, they come with some interesting bits and are worth a look. Eight Deleted Scenes fill a total of six minutes, 33 seconds. Given the length of these pieces, you can assume that they don’t add much, and that assumption would be correct. These are mostly just extensions of existing sequences, so don’t anticipate anything that really stands alone – or stands out. The extra bits are fun but fairly inconsequential. trailers - one teaser, one theatrical – for Part 2 and also includes two Previews. One looks at the “Warner Bros. Studio Tour London” and the other delivers a promo for “Pottermore”. After 10 years and eight movies, the massively successful franchise comes to a close with Harry Potter and the Deathly Hallows – Part 2. And it does so in spectacular fashion with a film that seems likely to be viewed as the best of the bunch. The 4K UHD offers very good picture, awesome audio and a strong set of supplements. This becomes the best way to watch a fine film.